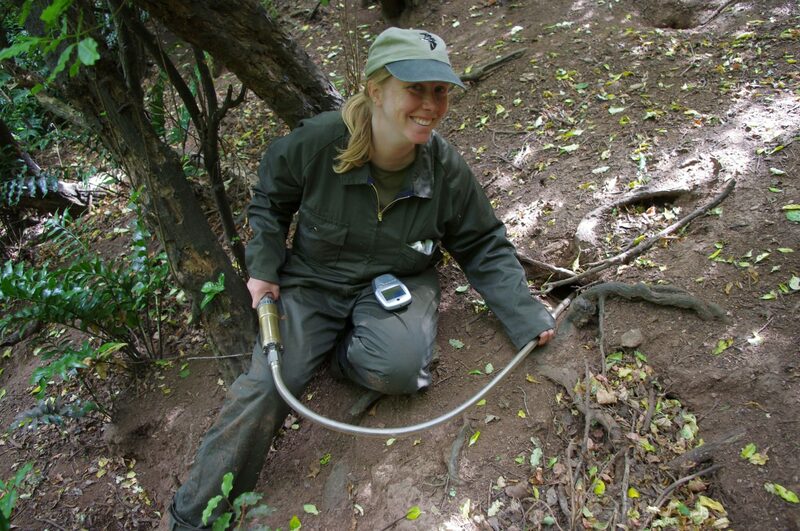 Over the past two (southern hemisphere) summers, Te Papa seabird researchers have been investigating population trends and foraging behaviour of flesh-footed shearwaters. These all-dark seabirds are well known to recreational fishers around the North Island and in Cook Strait, as the birds have the annoying habit of sitting behind boats and diving after bait. This behaviour puts the birds at risk of being hooked and drowning on both commercial and recreational fishing lines. There is also evidence that some birds are deliberately killed by fishers, presumably after they become angry with the birds interfering with fishing. Added to this is the alarming revelation that some New Zealand flesh-footed shearwaters tracked on migration were found to have foraged within a few kilometres of the damaged Fukushima Daiichi nuclear power plant on the east coast of Japan. All this means bad news for flesh-footed shearwaters, which appear to be declining throughout their range. Our study has two main parts – estimating numbers on land, and tracking where the birds go at sea. 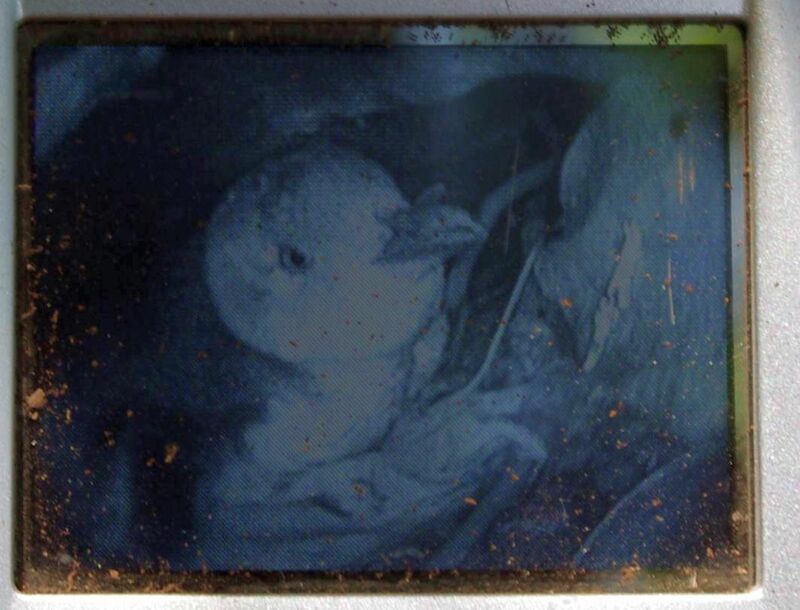 Flesh-footed shearwaters nest in deep burrows that they excavate in soft soil, and both parts of the study require a means to see what is under the ground. 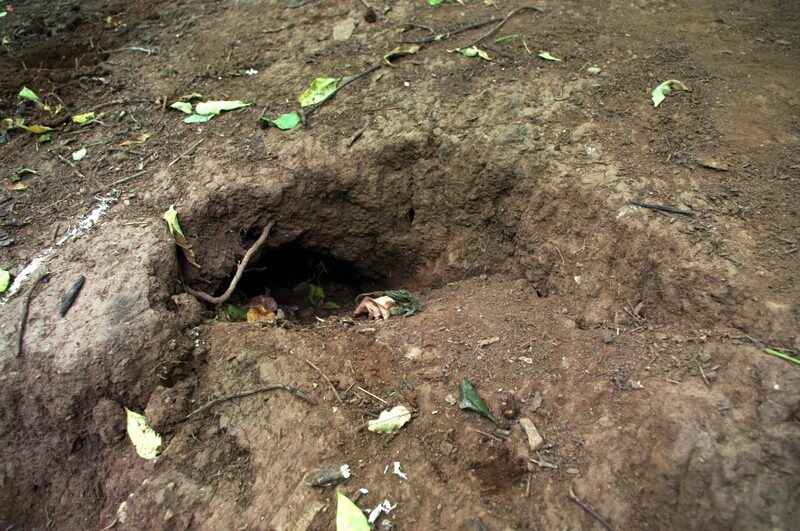 Other animals also live underground on the islands where flesh-footed shearwaters nest, and so estimating numbers requires both counts (or estimates) of the number of burrows, and measurements of occupancy rates, i.e. what percentage of burrows is occupied by flesh-footed shearwaters. 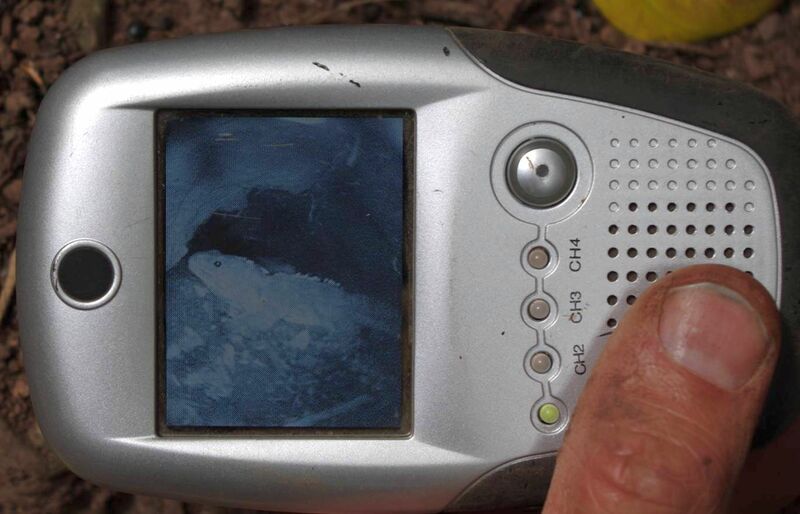 In addition, to track the birds at sea, we need to not only attach tracking devices to the birds, but to re-catch the same birds some weeks later to remove the device and down-load the data. 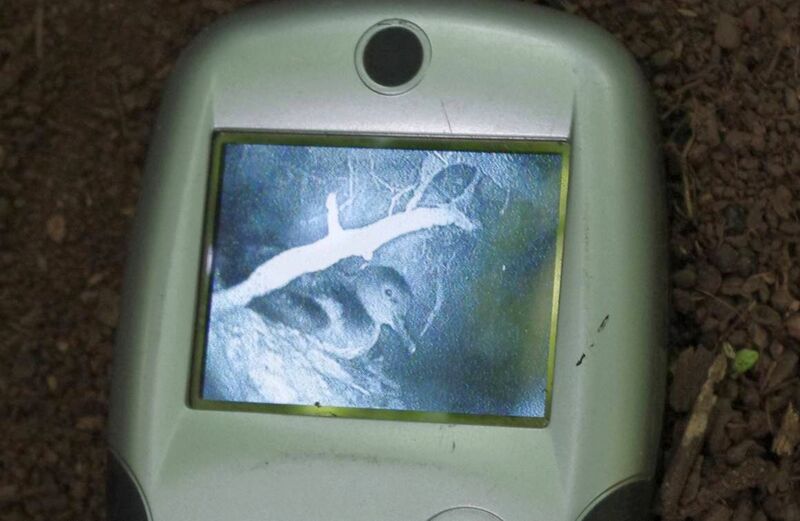 This requires selecting birds that are incubating eggs, and will have a high motivation to return to the same site after having a tracking device taped to their back feathers. 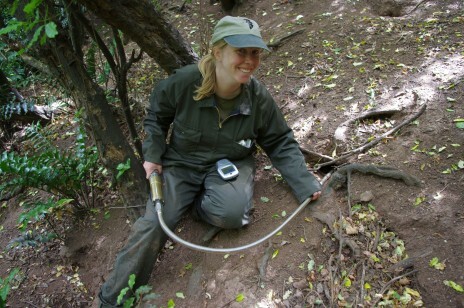 In order to see what species is in a burrow, and whether it is sitting on an egg, we use a device called a burrowscope. This is similar in principle to a surgeon’s endoscope, though of rather more robust design to cope with use in the field. A small camera lens surrounded by a cluster of lights is mounted on the end of a long flexible tube, which is carefully inserted into the burrow. An image from the camera is transmitted to a small video monitor screen, which allows the researcher to see what is in the burrow. On Titi Island in the outer Marlborough Sounds we found three bird species and one large reptile species living in the burrows. The accompanying images show some of the views we had on the burrowscope screen. 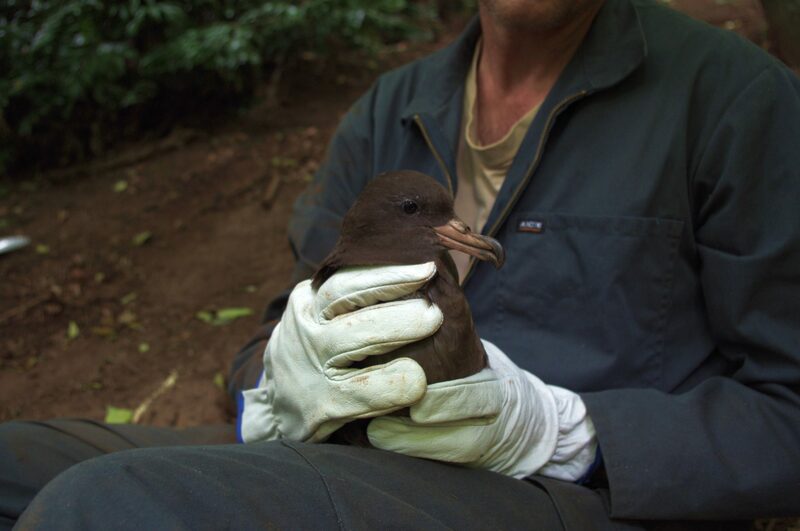 Our target species (flesh-footed shearwater) looks very similar to its cousin the sooty shearwater, which also nests on Titi Island. 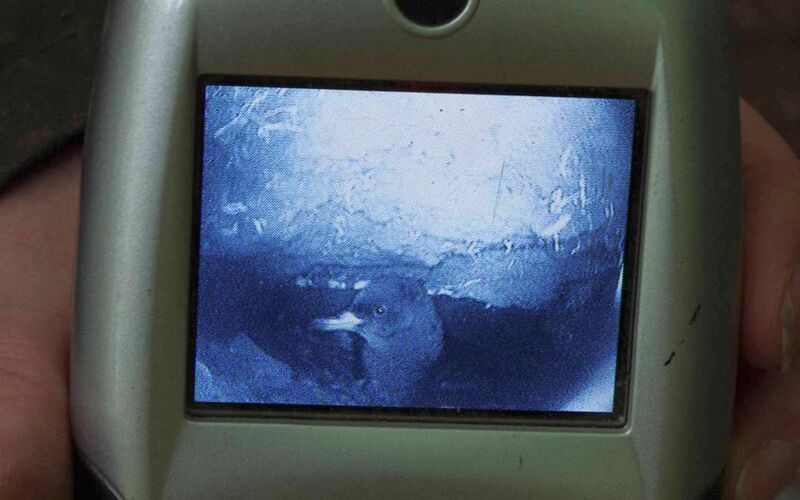 The main distinguishing character through the burrowscope is whether the bird has a slender dark bill (sooty shearwater) or a large pale bill with a dark tip (flesh-footed shearwater). 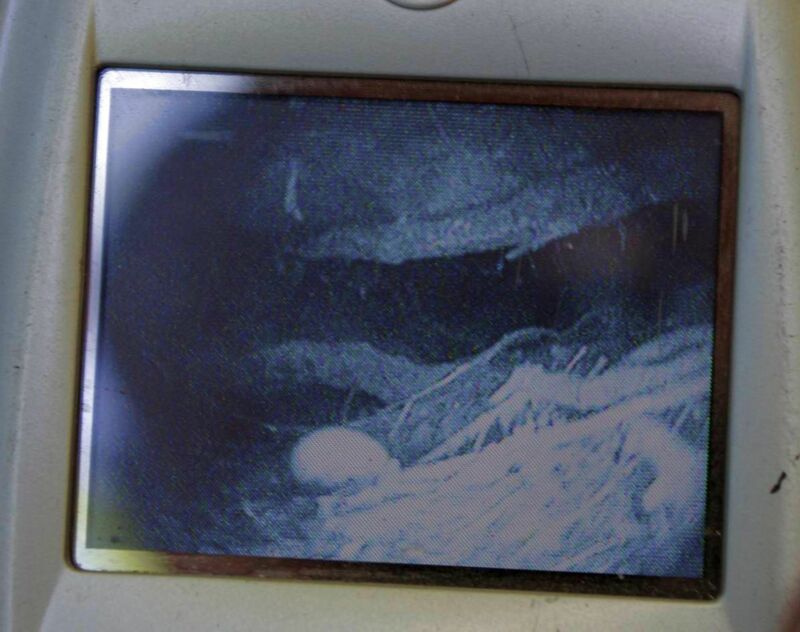 Several burrows were found to contain little penguins, which had climbed up the steep slopes from the rocky shore below. These birds had finished breeding for the year, and had returned to shore for their annual moult. The presence of a moulting penguin in a burrow was usually evident from shed feathers at the burrow entrance even before the burrowscope was inserted. The rarest of the burrow inhabitants was the tuatara – an iguana-like reptile unique to New Zealand, and with no close living relatives anywhere else on earth. Tuatara mainly eat large insects and also lizards, but occasionally take small seabirds and their chicks. They seemed to have an uneasy truce with the two large shearwater species, and we found some burrows occupied by both a tuatara and a shearwater.